What makes the best joint supplement for dogs? How to compare different pet supplement brands? There are number of things to have in mind when choosing the right joint supplement for your dog. The ingredients must be right, i.e. safe, effective, and top quality. The manufacturing should be of highest standard and according to GMP quality standards. The taste must be to your dog’s liking and finally the price must be the "best value for money". maxxiflex+ fulfils all these criteria. The ingredients are extremely important, and in more ways than one. The best joint supplement for dogs must include the right top-quality ingredients for dogs. The right ingredients are both safe and effective. Safe not only means the ingredients are safe for dogs' consumption. It also means that the dosage is the right amount for certain dogs' sizes. The dog supplement label must list all the active ingredients and the amount of each. It should also include directions for use, i.e. how much to give to different size of dogs. Safe is though not enough, the ingredients must also be effective. This means each ingredient should have some specific function in supporting canine joint health. Some ingredients may help ease joint pain, others may be anti-inflammatory or lubricate the joints. The best dog joint supplement includes number of active ingredients, so the composition (mix) is also important. Each active ingredient in maxxiflex+ plays a specific role in supporting canine joint health. The ingredients have been carefully selected and are in the right proportion to support and help maintain bone, cartilage, and connective tissue health. The right ingredients are however not enough, the quality of the ingredients is also extremely important. All the ingredients in maxxiflex+ are of premium quality and from trusted suppliers. All raw material is quarantined upon receipt, where it is tested for freshness, potency, and purity before being released for manufacturing. The quality, safety, and effectiveness of the active ingredients are vital. However, without quality manufacturing it cannot become the best joint supplement for dogs. The best dog supplements are manufactured according to Good Manufacturing Practices (GMP). Following GMP quality standards ensures consistent production quality. The lot number should be shown on every single bottle, allowing the manufacturer to trace the product through the production process. maxxiflex+ is manufactured in the USA, according to GMP quality standards set forth by the FDA. The lot number and best by date is shown at the bottom of every single bottle. Animal supplement manufacturing is not as regulated as human supplement manufacturing. This is why NASC (National Animal Supplement Council) was established. NASC is a non-profit organization that advocates and collectively enforces GMP quality standards in manufacturing, labelling, and marketing of animal health supplements. maxxiflex+ manufacturer is one of the founding members of NASC. We cannot argue with our dogs. If they don't like the taste of something, they will not eat it. No matter how good it is for them. Sometimes you may be able to get them to eat it by covering it with something they like. But you don't want to be bothered with that every day, or even twice a day. You want your dog joint supplement to be to your dog’s taste. Ideally, your dog will take it as treat. Another option is to put it in his food (without him leaving it behind). maxxiflex+ chewable tablets are liver flavoured and highly palatable. Most dogs love them as treat. The tablets are uncoated, so it is easy to break them into smaller pieces or crush them into powder if preferred. Dog joint supplements come in different price ranges. Those containing higher quality ingredients tend to be more expensive. When comparing the prices, you must make sure you are comparing apples to apples. It is not enough to compare the price of the bottle, you need to compare the cost per day. This table shows how to compare dog supplement prices. At first sight, bottle B seems most expensive, but the cost pr. day is similar as for supplement C. While bottle E is the cheapest to buy but turns out to be the most expensive supplement per serving. The cost per day is though not the only thing that matters. The lowest priced dog supplement is not necessarily the best joint supplement for dogs. You need to consider the ingredients as well, i.e. which ingredients are included, the quality, how effective are they for canine joint health, etc. Look for the best price for what you get for your money… and your dog. Remember, effective dog joint supplement can save you money in Vet bills in the future. Whether the dog you love is happiest walking by your side, running up ahead, or cuddling in for kisses we believe all dogs should move pain-free. 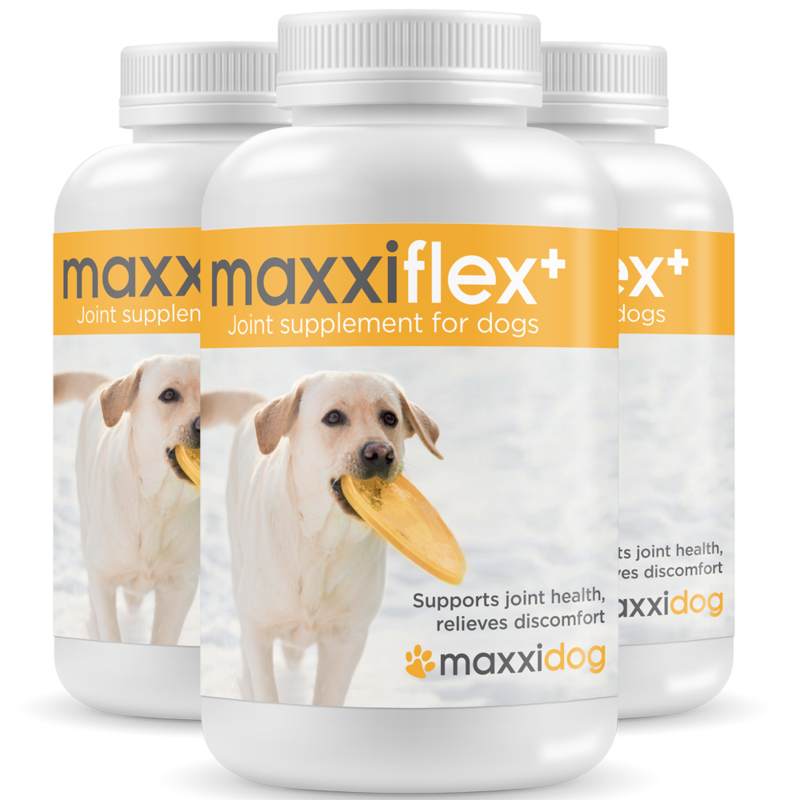 With maxxiflex+ build a joint-healthy lifestyle for your dog and help your dog move easier.